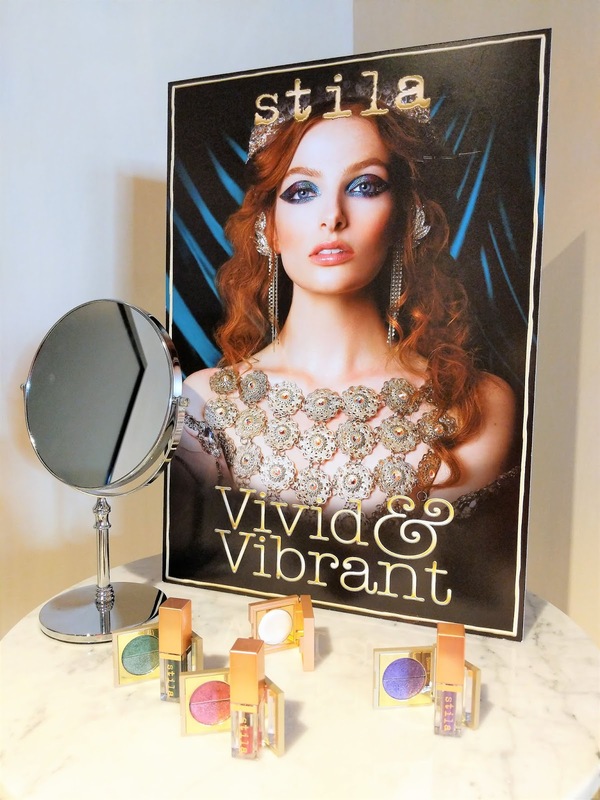 This post contains gifted items as part of an ongoing relationship with Pixi Beauty, as well as items I have purchased myself. All opinions however are 100% my own. Hello 2019! By the time I am writing this, we are starting February so surely that means I am way too late with saying Happy New Year right?! Well, fact is we are in 2019, a new year, which usually means starting off with a mountain of new year's resolutions. I personally don't do them but it's hard to avoid the heaps of adverts about being healthy, getting fit and let's not forget all the numerous dating sites. Although I don't place myself in any of these boxes, it doesn't mean I can't jump on the bandwagon of wanting to be healthier and sorting out a good skincare routine plays a big part in that. Last year I spent the majority of the year being pregnant and with that comes naturally glowing skin which is pretty low maintenance. This time however, I am finding myself going back to the issues I had before: tired skin, puffy bags under my eyes and redness on my cheeks. 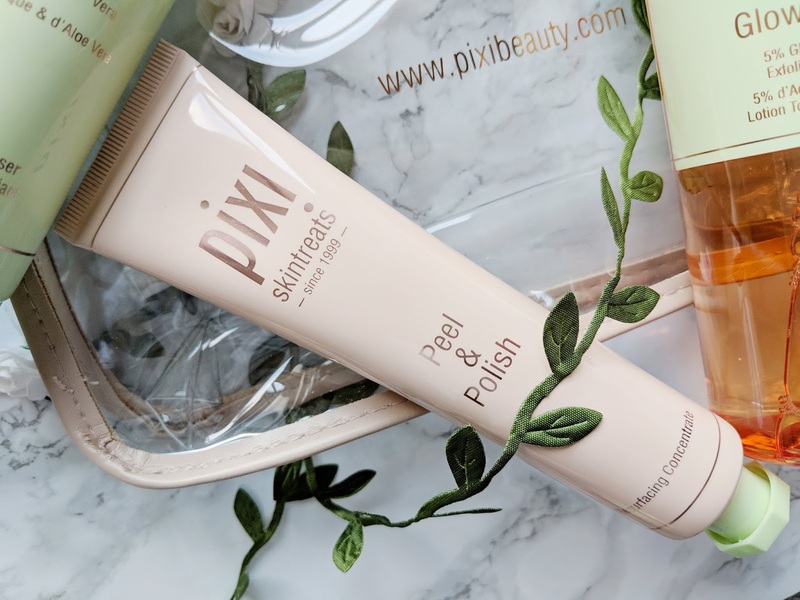 Over the years I have tried many brands, creams and other skincare but there haven't been many items my skin agreed with until I tried Pixi Beauty. 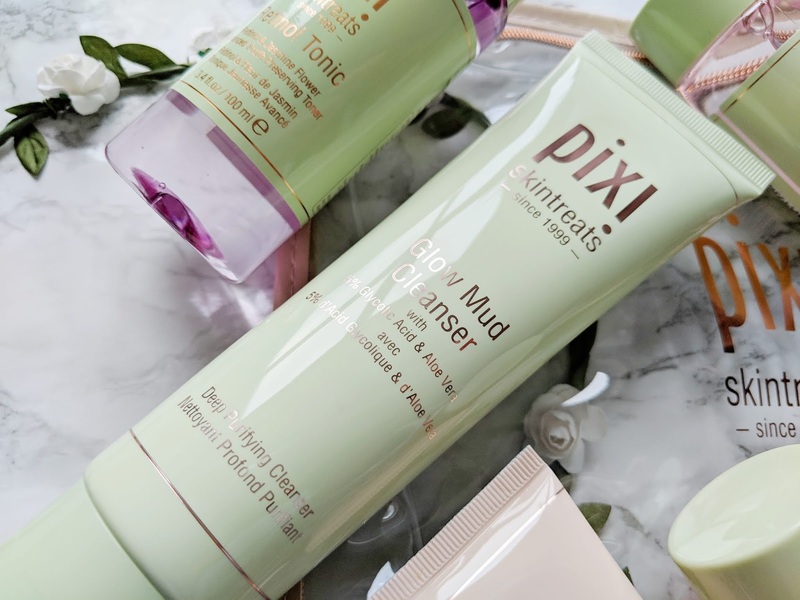 Last year I was incredibly lucky to get the opportunity to collaborate with them and try out some of their products, so it's only fair that I dedicate this blog post to Pixi and share with you the products I am currently loving. Let's start with the first step of my skincare routine and the first item I tend to grab: the Peel & Polish (£26 per 80ml). Peel & Polish is an enzyme peel that promises to reveal radiance for smoother, softer skin with a healthy looking glow. It contains fruit enzymes, used to loosen dead skin cells and the Peel contains lactic acid to exfoliate with cellulose peels and sugar extracts to polish the skin. The idea is to use this AM or PM, 2 to 3 times a week, leave on the skin for 2 minutes, rinse and pat dry. I bought this in the Christmas sale a couple of years ago as part of the Box of Beautiful Skin and I am so glad I did because I absolutely love it. The texture of the Peel & Polish is so soft, unlike many other exfoliators I've tried. It's quick to use and it leaves my skin feeling so soft and clean. I love using it in the morning or as part of a proper face mask session at the weekend. Another one of my first step favourites is the Glow Mud Cleanser (£18 per 135ml / £6 per mini). This deep pore cleanser is gently exfoliating and purifying, and contains 5% Glycolic Acid and soothing botanicals such as Aloe Vera. The cleanser can be applied AM or PM by massaging a small amount into the skin for 30 seconds after which it is rinsed off. The thing I love most about this cleanser is that it's as deep cleansing as a mud mask, but can be done in under a minute. It's perfect when you don't have a lot of time but still want to give your skin that clean, fresh feeling. I've also noticed that it's great for breakouts! With mud masks I often find that they leave my skin feeling tight and dry, but the Glow Mud Cleanser doesn't do that at all. The cleanser is suitable for all skin types and I'd say a small amount goes a long way. 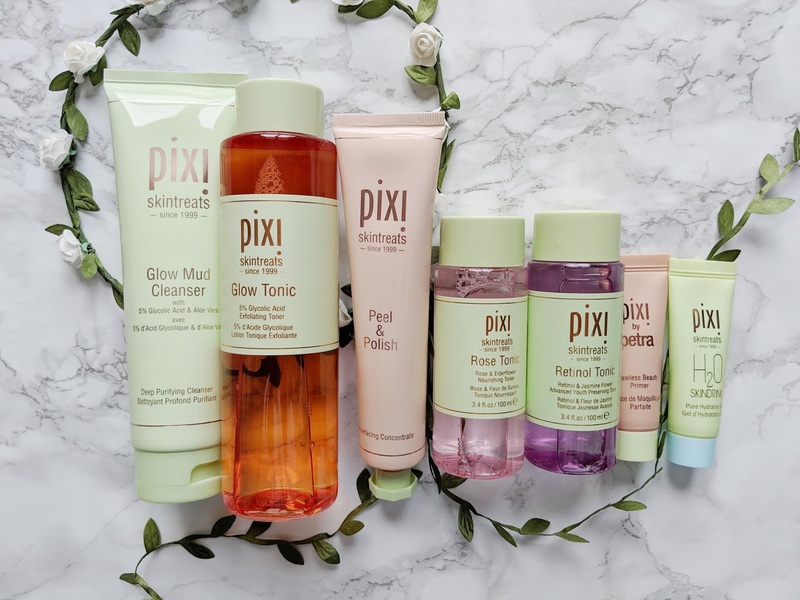 Next up is the Pixi Tonic family of which I'm currently using three different ones. In the morning I love using the Rose Tonic (£10 per 100ml / £18 per 250ml) to wake up my skin. 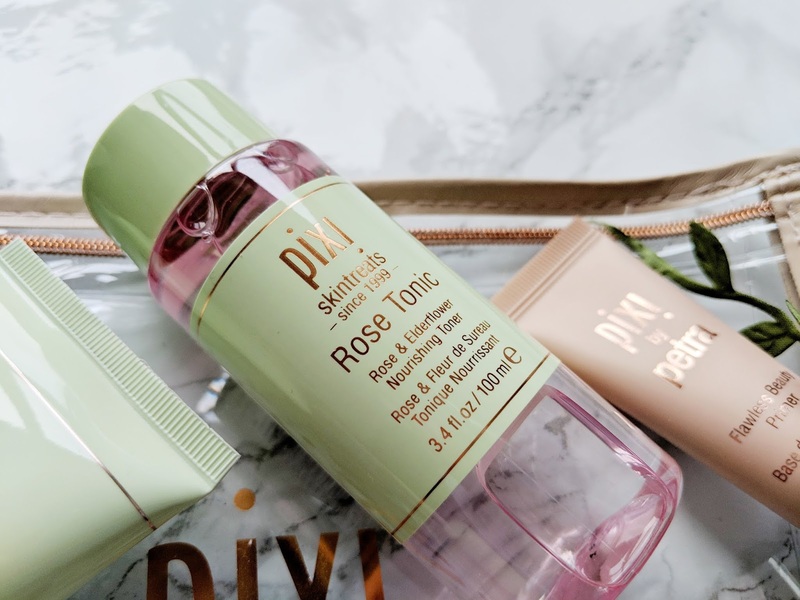 Pixi's Rose Tonic is super nourishing, hydrates the skin and soothes it at the same time. I suffer from sensitive skin that is prone to redness and I love how this tonic calms it down. 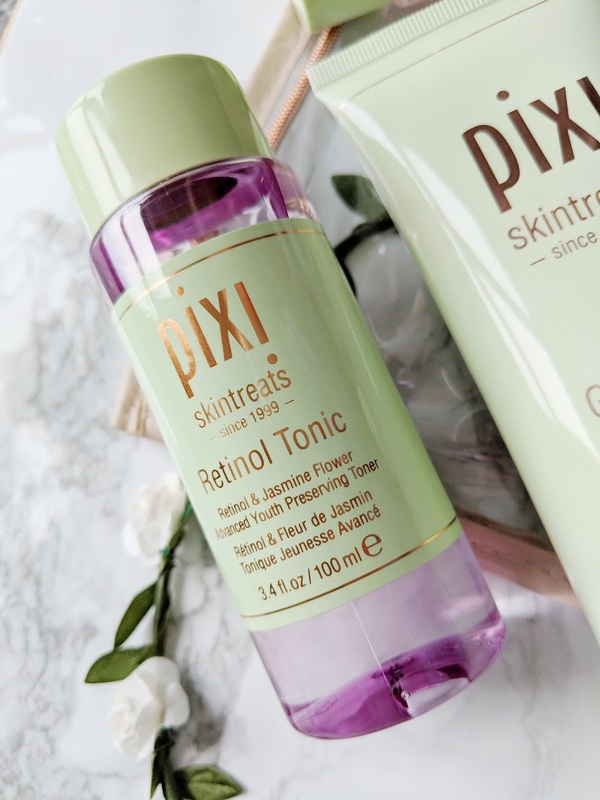 I'm normally not a massive fan of rose scented products, but Pixi have got this covered as the tonic has such a subtle fresh scent which is not too overpowering at all. The Rose Tonic is suitable for all skin types, but especially useful if you're suffering from redness or hypersensitivity. In the evening I alternate between two other tonics: the ever so famous Glow Tonic (£5 per 15ml / £10 per 100ml / £18 per 250ml) and the new Retinol Tonic. The Glow Tonic contains 5% Glycolic Acid, which acts as a cleanser and brightens the skin. What I find so interesting about this tonic is that initially when I used it, I liked it as it made my skin feel super fresh and clean, but it was nothing more than that, however I have since then changed my mind completely. You have to stick with this tonic for a while in order to truly realise how good it is. This is because during the first few weeks of use, the toner works with the top layer of the skin, but with continued use, it actually penetrates that top layer and really goes down into the pores and deeper layers which is what will eventually leave you with that glowing skin. I have used it for about a year now and I can honestly say I will never go back. It is truly unlike any other tonic I have ever used. To give you a little tip: Glow Tonic works great as a pre-tanning treatment or to remove fake tan! The Retinol Tonic (£10 per 100ml / £18 per 250ml) on the other hand is a new one to me. It was added to the toner family somewhere last year, but because I was pregnant I couldn't use it. I still can't use it as much as I would like to (breastfeeding a baby and all that, you know what I mean! ), but I am looking forward to seeing what this does for my skin in the future. It promises to reduce fine lines and smooth the complexion, but I haven't used it often enough yet to be able to comment on this. However, as the Rose Tonic and Glow Tonic have been such a hit, I have high hopes for this one too! Finally a couple of things to finish off my skincare routine: the H2O Skindrink and the Flawless Beauty Primer. I bought these as minis a few months ago, as I always find that a good way to try out new things without breaking the bank. 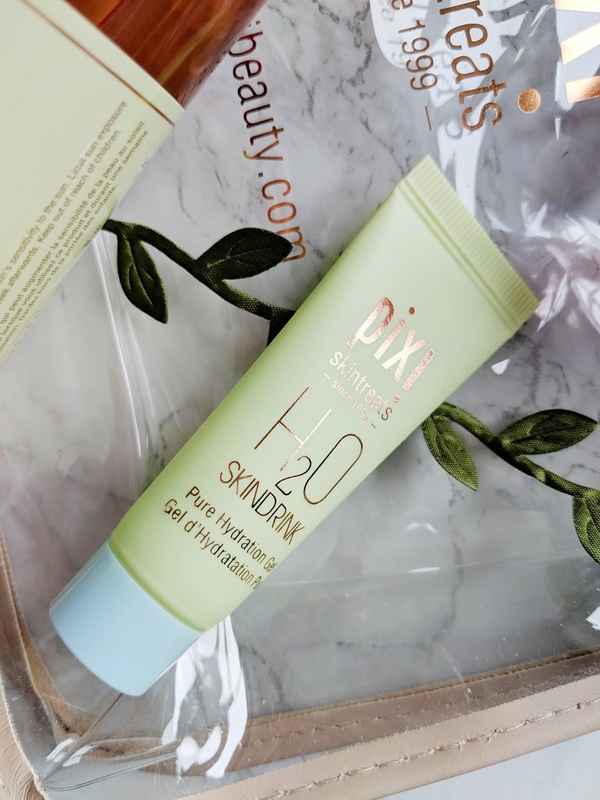 The H2O Skindrink (£24 per 35ml / £6 per mini) is super hydrating moisturiser that has a gel texture, and leaves the skin feeling refreshed and rejuvenated. The reason I love this so much is because it has a cooling effect which helps me cope with the heat during the warm summer months, but also prevents my skin from going super dry during the winter months because it is so hydrating. It contains green tea, Aloe Vera and rosemary and the formula is super lightweight. I've only used it a few times, but I can already tell you I will be repurchasing the full size version as soon as I run out! A little tip for you: stick it in the fridge and apply chilled on under-eye area. I promise you, this will instantly reduce any puffiness! The Flawless Beauty Primer (£24 per 30ml / £9 per mini) is a makeup primer that helps your skin look more even and radiant. It is slightly glowing, but once applied it looks natural so no need to be worried that your face looks glittery or that it adds too much glow. I love using this primer during winter when my skin looks dull. 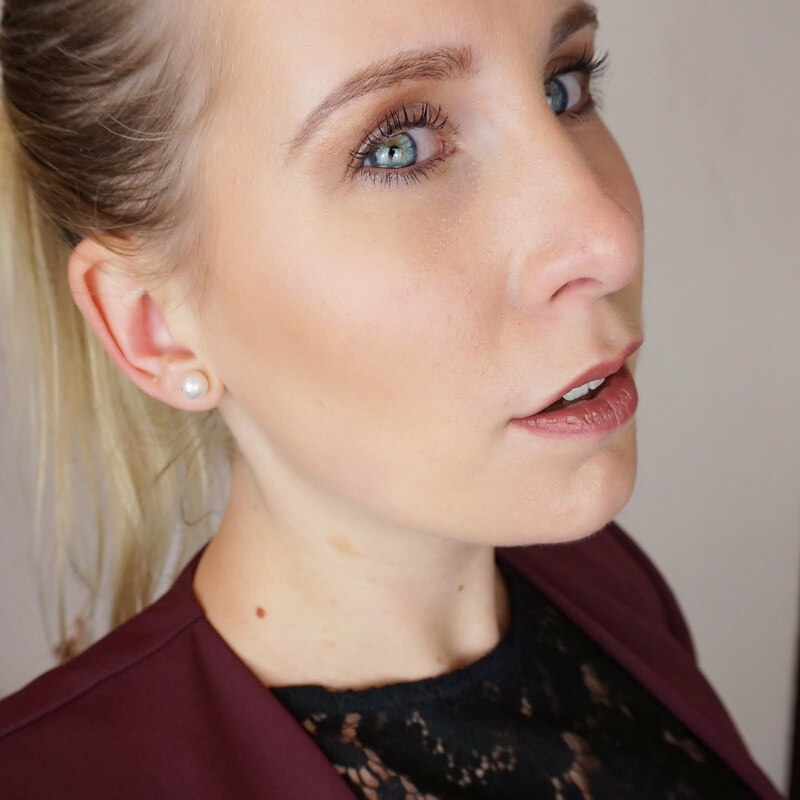 It gives me a natural glow whilst forming the perfect base for any makeup and makes it stay put throughout the day. I bought this in a mini version too, but I am seriously thinking about repurchasing the full size once finished. So these are the Pixi Beauty items I am currently using. 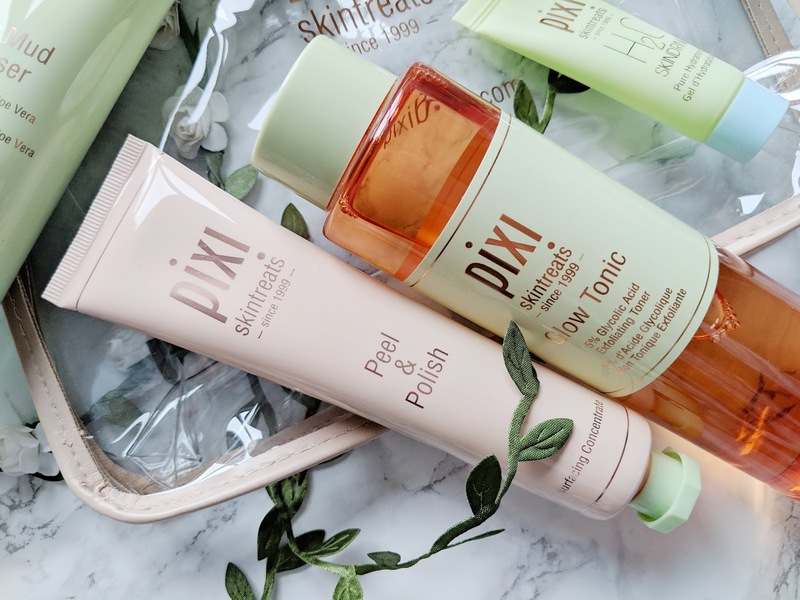 I can honestly say that so far I have loved everything I've tried from Pixi and I can't wait to try out their new Vitamin C and Milky range! 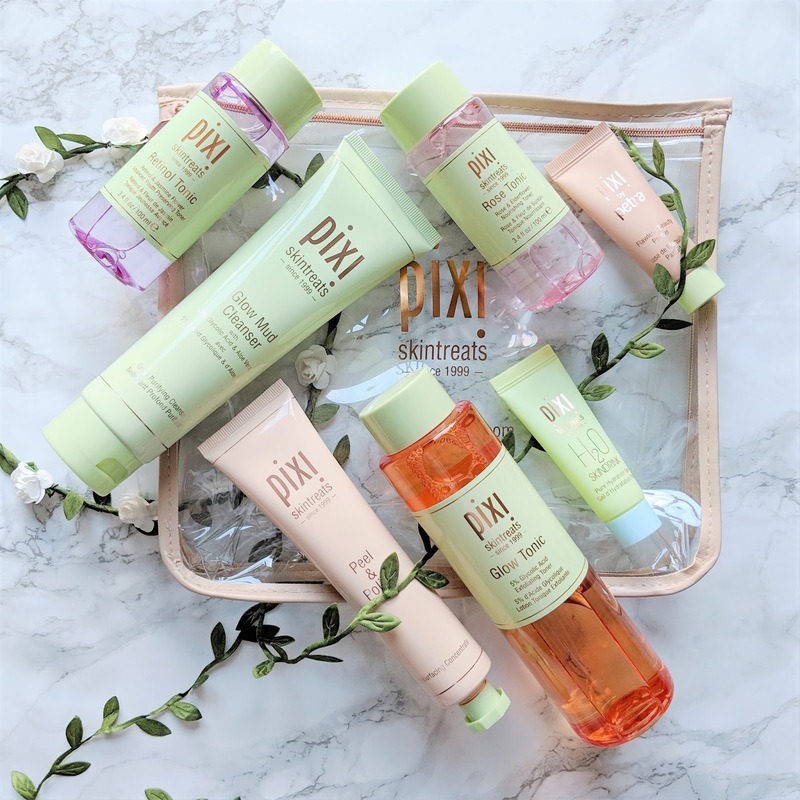 What are your Pixi favourites or which product are you dying to try? I would love to hear all about it so please feel free to leave a comment below! As always, thank you for reading and I hope you have found this post useful. Any feedback is always much appreciated.